SALUTATIONS, as the spider said — and welcome to AuthorBethMacy.com. I’m a journalist and author, a newly-emptied nester (sniff), a frequent lecturer/speaker, a native Midwesterner (but Southerner for more than half my life), a former newspaper reporter, and the tired co-owner of two kind of terrible rescue dogs, Charley and Mavis. On Aug. 7, 2018, Little, Brown and Company published my third (and by far hardest) book, “DOPESICK: Dealers, Doctors, and the Drug Company that Addicted America,” a look at the national opioid epidemic. It was an instant bestseller, garnering positive reviews, lots of radio and television coverage — including an interview on Fresh Air — and a television series option with Fox 21 Studios and Warren Littlefield. I wrote this book the only way I knew how — by witnessing the epidemic’s landing in three Virginia communities over two decades and getting to know the people on the front lines. From distressed small communities in central Appalachia to wealthy suburbs, from disparate cities to once idyllic farm towns, it’s a heartbreaking trajectory that explains how the national crisis became so entrenched. 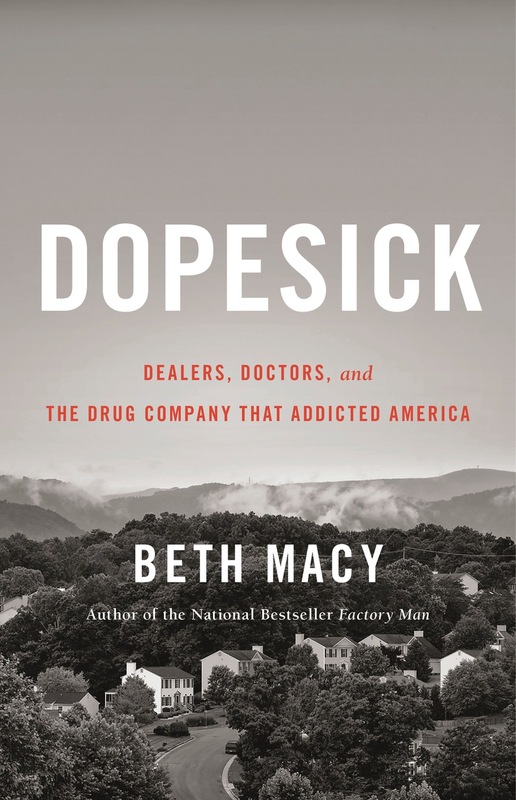 For DOPESICK, available for order here, I drew upon thirty years of reporting from southwest Virginia communities, just as I did in FACTORY MAN and TRUEVINE, both of which were named among The New York Times Book Review’s 100 Notable Books. My work has long sought to bring attention to the marginalized and largely voiceless — the people left behind by growing inequality, technology, and globalization. Dopesick begins with a 2016 visit to interview a convicted heroin dealer in prison at the request of Kristi Fernandez — that’s her arm in the photo, with her son’s 5-year-old signature. Kristi asked me to help her figure out how her burly construction-worker son, 19-year-old Jesse Bolstridge, became a heroin-overdose statistic. Elsewhere on my website you can read about my upcoming book signings and talks, some recently published book reviews and articles I have written, advice I gave to college graduates, and my storytelling philosophy. (True fact: “There are no good stories in the newsroom.”) Among the themes that permeate my work: I grew up poor. Many of my best ideas have come from photographers I know and love. Some of my favorite writers are Robert Caro (love his advice: “time equals truth”), Bryan Stevenson, Roxane Gay, Anna Quindlen, Tracy Kidder, Robert Gipe, and Abraham Verghese. If you haven’t yet read Elizabeth Catte’s “What You Are Getting Wrong About Appalachia,” please do so now! I have been accused of overusing em dashes, I prefer interviewing people in their kitchens, and I have gradually learned, after decades of following Associated Press newspaper style, to appreciate the book-writing charms of the Oxford comma. My favorite writing implements are the Pilot Precise V5 (extra fine, black) and the Palomino Blackwing 602 (its worthy motto is: “Half the pressure, twice the speed”). I’m addicted to a moveable white board product called Wizard Wall and have it plastered all over my office. I sometimes play hooky on Friday afternoons, where you’ll find me at my neighborhood movie theater, with a kids’ pack in my lap, and after that maybe sipping a Factory Girl IPA in the bar next door at Local Roots. Thank you for reading my work.